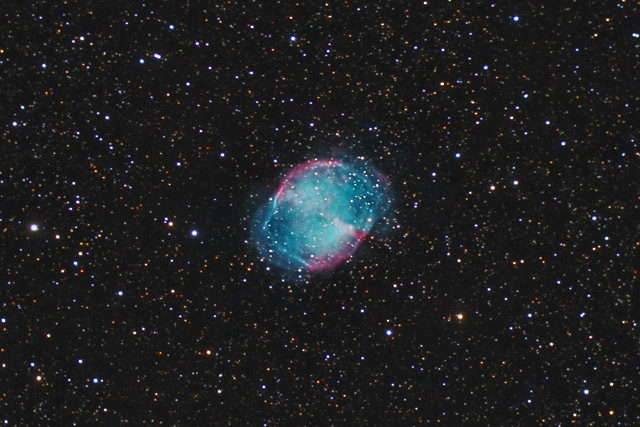 M27, the Dumbbell Nebula is a planetary nebula - a nebula created as a star is reaching its final days. As the star starts to burn out, it blows off a shell of gas. As this gas expands, it is heated by the star and shines. We see this shell as a planetary nebula. In this photo, you can easily see the star that created the Dumbbell - it is the star that is exactly at the center of the nebula. 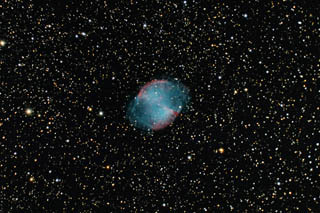 M27 is an easy object in a telescope, as it shines brightly at magnitude 7.5 and is relatively large at about 8' wide (about 1/4 of the moon's apparent diameter). In this image, North is Up. This image is cropped to 59% of the original full frame. Software Used Images Plus 4.0 for camera control, calibration, and stacking. Images Plus 5.0 for digital development, advanced Lucy-Richardson deconvolution, multiresolution sharpening, star shrinking, smoothing and noise reduction. Photoshop CS5 used for levels and curves, selective color, high pass filter, star shrinking, lab color, saturation adjustments, vibrance, screen mask invert, lens correction, hdr toning, unsharp mask, and smart sharpen. Gradient Xterminator for gradient removal. Carboni Tools for additional saturation adjustments, noise reduction, and smoothing. Focus Magic for focus restoration. Notes I had photographed M27 in May 2011. The improvements in this version are subtle - the overall color is more accurate, the details are sharper, and the overall noise is lower. I was also able to capture some of the outer reaches of the nebula better. This version is also cropped in a little tighter than the prior M27.